Attention all students, faculty and staff: it’s that time of year again! In anticipation of the Student vs. Faculty Basketball game coming up next Friday, student council has planned a spirit week starting on Monday! 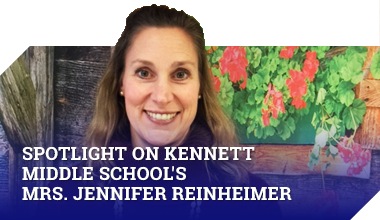 Each day will have a different theme that you can dress up for and show your Kennett PRIDE. Monday will be Pajama Day, so come to school dressed in your comfiest PJs! ​Just reminder that appropriate school dress still applies including no hair paint or face paint. Wednesday (2/27) – Style Wars: Each grade is looking fresh in their polka dots, striped, and plaid. Thursday (2/28) – Throwback Thursday: Reminisce about the past and dress up like you belong in your favorite decade! Friday (3/1) – KMS Spirit: Show your KMS pride by wearing Blue and White! And then join us at the Student-Faculty basketball game Friday night. Please check the board outside of the Cafeteria to make sure your name is listed under the appropriate sport. You must have written parent consents and sports physical to be cleared for tryouts. If your name is not on these lists, see Mrs. Shannon in the nurse’s office today. Student Council will hold a brief meeting today after school between 2:35 and 3:15 PM in A103. Thanks! FCA will meet tomorrow morning at 6:50am in Mr bowling’s room. There will be donuts! Tuesday (2/26) – You are looking good out there in your favorite sports team gear! Please stay tuned for a sneak peak of Friday’s big event. Today we will have a fall and winter sports assembly during part of 7th, 8th and 9th period. See you in the big gym. Student Council will hold a brief meeting on Wednesday, Feb. 27th between 2:35 and 3:15 PM in A103. Thanks! This Friday, March 1, the Kennett Middle School Students and Staff will face off in the annual Student-Faculty Basketball game to support “Unite for Her.” The game starts at 6:30 and we’ll look forward to seeing you all there. Monday (2/25) – We are so proud of those who wore pjs. Way to go and love your school spirit. Tuesday (2/26) – Sports Day: Dress up in your favorite team’s gear! Tomorrow we will have a fall and winter sports assembly during 8th and 9th period. See you in the big gym. Hello 8th graders that are attending today’s field trip to the TCHS. If you have a signed permission form with you, please hand it in to Guidance now. You will be leaving for the busses during 5th period. You are taking the same bus today as you did when we toured the high school. If you have forgotten what bus you take, a bus list has been posted at the end of each 8th grade hallway. Ms. Boder will also have a bus list with her in the cafeteria during lunch today. Our School Dental Hygienist will be doing dental exams for 16 students in the nurse’s office between 11:45 – 12:15 today. Passes will be given to students during homeroom. If you receive a pass, please arrive promptly at the designated time in the nurse’s office. Monday (2/25) – Pajama Day: What’s better than getting to wear your comfiest PJs to school!? Please stay tuned for Flocabulary. Yesterday was the end of Term 5 and we will still switch to Term 6 today. This affects students in Cooking and Sewing. We will now print progress reports on Monday and distribute them in homerooms on Tuesday. Attention 8th grade students, remember that this Friday is our trip to the Technical College High School. If you have not turned in your permission slip get it in right away. You do not want to miss this trip with your friends. The Kennett Middle School Service Learning Group visited the Avondale Firehouse and the Southern Chester Police Department on Tuesday, 12/11/18 to deliver cookies as a gift of gratitude. This group of seven students volunteered to be a part of a group who created and implemented this service project of their own design and choosing. The group, who call themselves “Team Awesome”, met once a week to learn various interpersonal and leadership skills, while creating a service project for the community. After brainstorming several options, Team Awesome chose to honor the first responders to thank them for all they do to protect the people of our community. These students baked cookies and wrote thank you notes and then hand delivered them to offer their words of gratitude in person. Students enjoyed working as a team to thank the first responders for working hard every day to keep our community peaceful and safe. We are looking for a few more awesome students to join the team! If you are interested, please sign up! A sign-up sheet will be available during lunch tomorrow and then it will be posted on the Guidance Office window. Don’t wait, join our team and be awesome! Friday (3/1) – KMS Spirit: Show your KMS pride by wearing Blue and White! And then join us at the Student-Faculty basketball game tonight! Wrestlers, we still do not have many uniforms returned. PLEASE, PLEASE, PLEASE get them turned in right away. Write a note to yourself in your agenda or set a reminder on your phone. Let’s make it happen. We now present January’s PRIDE students of the month. Attention all students and staff. Our KMS team has completed our What’s So Cool About Manufacturing documentary and voting has officially begun. The voting window closes today so we are down to the wire to register as many votes as we can. Today, please take a moment to vote for your fellow classmates. The contest page can be found at www.whatsocool.org. That web address is www.whatssocool.org. Once you reach the page, select “Chester-Delaware” under the 2019 Contest dropdown menu. There you will have the opportunity to view all of the video in the contest as well as the vote for the Kennett Submission. You’re able to vote multiple times if you simply refresh the page. So, if you will, vote early and vote often. Also, If you’re willing, please share the link with friends and family. Longwood Gardens is excited to announce that applications for their Summer Teen Volunteer Program are officially open! The Longwood Teen Volunteer Program is an eight-week summer program that provides high school students with an opportunity to become part of the Longwood Team. Participants will gain work experience and learn leadership skills in a positive and enriching environment. While working in this positive, fast-paced environment, teens will have the opportunity to earn volunteer hours, give back to the community, and make new friends. For more information and to learn how to apply, pick up an orange flyer from the 8th grade bookshelf in the guidance office. Applications are due by February 18th. Students participating in the Grade 6 Mindfulness Group, please report to the designated meeting space during 6th period today. We will meet at 11:47 am. Don’t forget to get your pass from your homeroom teacher! See you soon! Attention all students and staff. Our KMS team has completed our What’s So Cool About Manufacturing documentary and voting has officially begun. The voting window will close on Friday, tomorrow, so we have only today and tomorrow to register as many votes as we can. As we have in the previous two years, we ask that over the next few days that you please take a moment to vote for your fellow classmates. The contest page can be found at www.whatsocool.org. That web address is www.whatssocool.org. Once you reach the page, select “Chester-Delaware” under the 2019 Contest dropdown menu. There you will have the opportunity to view all of the video in the contest as well as the vote for the Kennett Submission. You’re able to vote multiple times if you simply refresh the page. So, if you will, vote early and vote often. Also, If you’re willing, please share the link with friends and family. Now, stay tuned for this year’s “What’s so Cool About Manufacturing” Video. KMS 8th grader and Spelling Bee Champion, Brandon Castaño, competed yesterday in the Chester County Spelling Bee. Brandon went 10 rounds to finish in the top 10 spellers in the county. While he did not win, he represented KMS, his family, and himself with pride and dignity. Congratulations, Brandon! Wrestlers, please make sure to return your singlets to the main office right away. Once you reach the page, you will have the opportunity to view all of the videos in the contest as well as vote for the KMS video. You’re able to vote multiple times if you simply refresh the page. So, if you will, vote early and vote often.